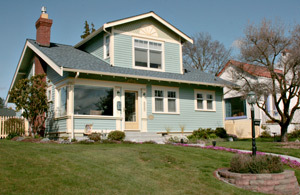 We bought a 1920’s bungalow years ago here in Broadway Park, Bellingham. As our restorations continue, we are reminded daily of how valuable The RE Store has been for us through this process. To date, every room in our home has benefited from the store. One of our first projects was to replaced several non-vintage closet doors. We knew that louvered doors were not correct for our period home and we felt very fortunate to find and purchase several doors from The RE Store that fit our spaces appropriately. Another project was to replace three hot water radiators that had been previously removed from the bathrooms and kitchen. It was really wonderful to find the perfectly operable vintage radiators and restore that type of heat to three very important spaces in our home. We have replaced light fixtures, door hardware, wood trim, and screen doors; We have purchased old school bleachers to replace our basement stairs and recycled cabinetry from Western’s old chemistry lab for our garage work bench ; we even found a wonderful vintage deep sink and small hot water heater for a garage that has been used extensively throughout this remodel and process. Most recently, we have removed the carpet from our stairway and are planning to strip them and refinish them. Unfortunately, upon removing the carpet we discovered a broken stair. What are the chances of finding 5/4 fir with one rounded edge to match those in our staircase? Well, we found the wood at The RE Store! OF COURSE!!! We are reminded how valuable you are to our community every time we look around our home. We thank you for being there for two people who have never restored a home before. We love our vintage 1920’s bungalow and so appreciate being able to find the materials we need to restore the true character of this wonderful old home. They do not build them like this anymore. With The RE Store’s help, this home will still be standing for another 96 years!